Ahhhh, so many of you thought I was sharing a real recipe yesterday! I was shocked, but literally laughing out loud at each and every comment. I think this is the first time I’ve ever pulled off a real April Fool’s joke. Usually, I forget what day of the week it is and miss my opportunity. Hopefully I didn’t scare anyone away for good. Are you still out there? Hello? 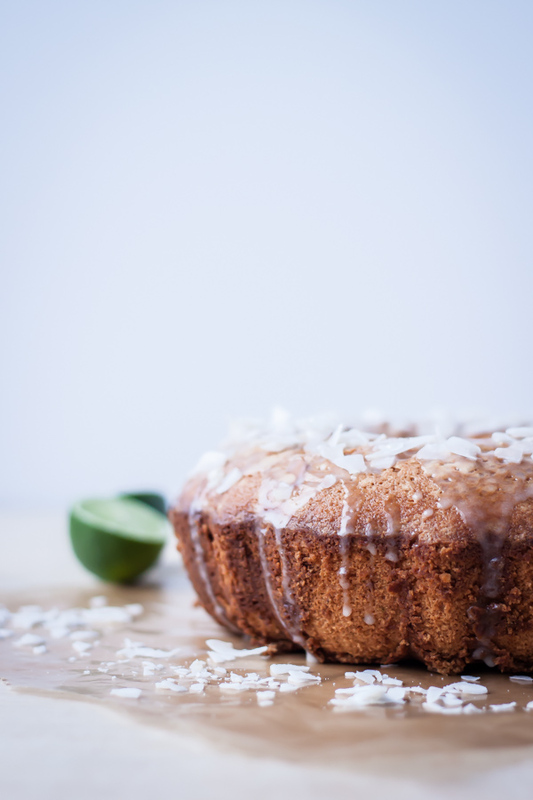 If you are, you will be happy to know that today’s coconut cardamom lime tea cake is not only (incredibly) edible, but pretty damn delicious if I do say so myself! It is the kind of cake that you’ll feel like munching on all day long (and I wouldn’t say that about just any cake). I may or may not have done that after I made it myself. 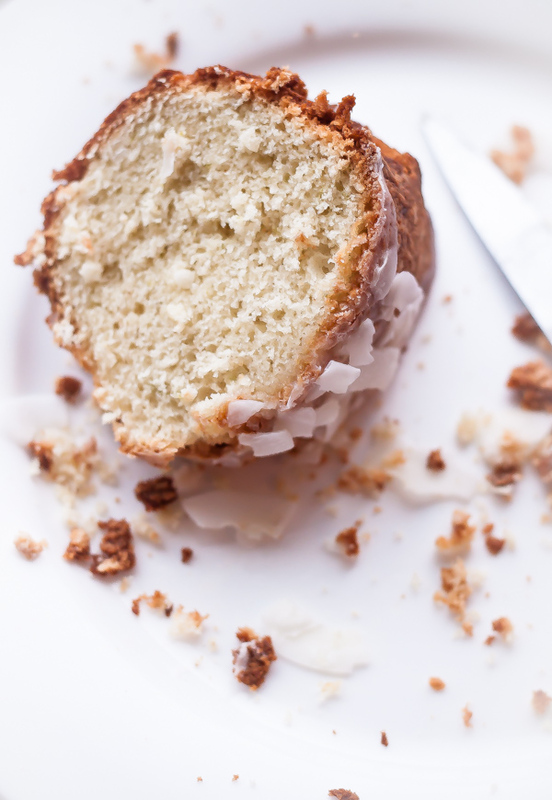 The basic recipe for today’s coconut tea cake comes from one of my favorite cookbooks, Dorie Greenspan’s Baking: From My Home to Yours. Instead of using milk as the primary liquid, this cake uses full-fat, unsweetened coconut milk. Unsweetened coconut flakes (or shredded, see recipe for instructions) are then folded into the batter for extra good measure. 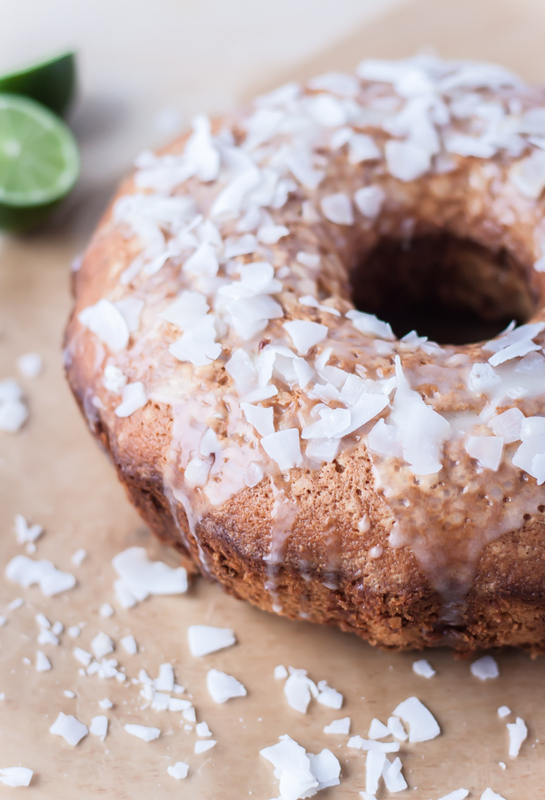 In the book, Dorie suggests a few optional flavor variations to this cake–but I chose to go in slightly different direction by adding both ground cardamom, fresh lime zest, and topping the whole thing off with a simple lime glaze and coconut flakes for texture and added flavor. 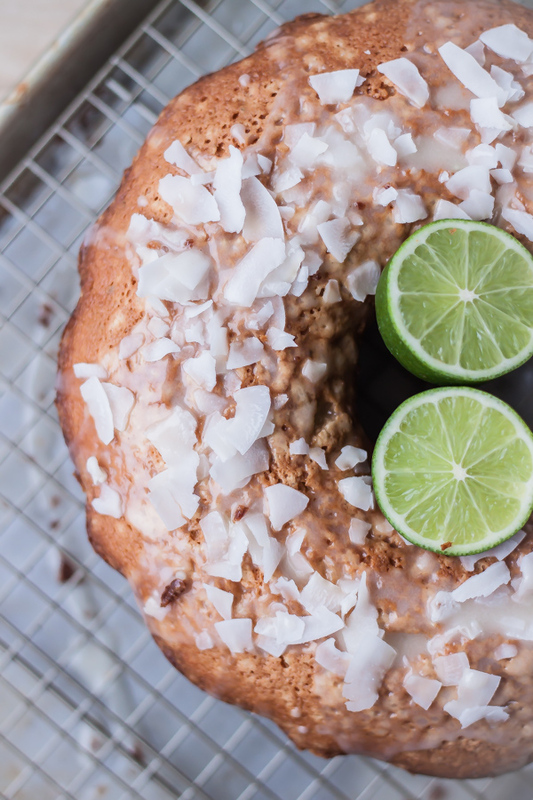 Coconut and lime are a classic pairing. But the lime and the slightly floral, warm undertones of cardamom go equally as well together–something I discovered last year after making a lime and cardamom frozen yogurt (from a different, but equally as coveted, ice cream cookbook). The resulting cake is light, subtly sweet, but addicting. Cardamom seems to be one of those spices that evokes very different emotions. People either love it or hate it. It happens to be one of my personal favorites, but if you are not a fan, just leave it out. The cake will be different, but just as good without it. Can I also mention that this cake is practically guilt-free because it contains only four tablespoons of butter? Preheat the oven to 350 degrees Fahrenheit. 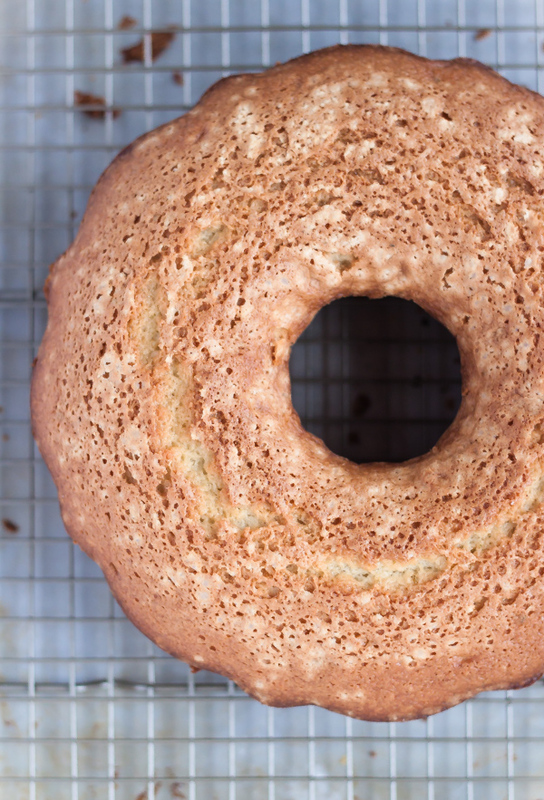 Generously butter or grease a 9- to 10-inch bundt or Kugelhopf pan. In a bowl, whisk together the flour, baking powder, cardamom, and salt. Set aside. Combine the coconut milk and butter in a small saucepan and place over medium low heat. Whisk until the butter melts completely. Remove from heat, but keep mixture warm. Combine the sugar and lime zest in the bowl of a stand mixer. Using your fingers, rub the zest and sugar together until fragrant. Add the (room temperature) eggs to the bowl. Using the whisk attachment, beat the sugar and eggs together until pale and thick–roughly 3-4 minutes. Then, beat in the vanilla and rum. Over low speed, slowly add the flour mixture until just combined. Scrape down the bowl with a spatula to ensure that all of the ingredients are incorporated. Over low speed, add the shredded coconut (or alternatively, you can process flaked coconut in a food processor until fine). Slowly pour in the warm coconut milk and butter mixture, and mix until the batter is smooth. Scrape down the bowl and pour the batter into the greased pan and bake for 55-65 minutes, or until cake is golden brown and a knife inserted comes out clean. Allow the cake to cool (in the pan) on a rack for 5-10 minutes before unmolding. Allow the cake to cool completely before glazing (see below). In a bowl, whisk together the lime juice, powder, and cream. Pour the glaze evenly over the top of the cooled cake. Cake can be wrapped in plastic wrap and held at room temperature for up to four days. 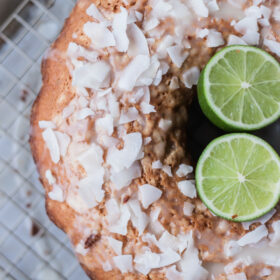 Adapted from Dorie Greenspan’s Coconut Tea Cake.